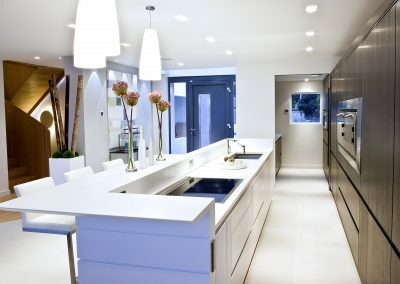 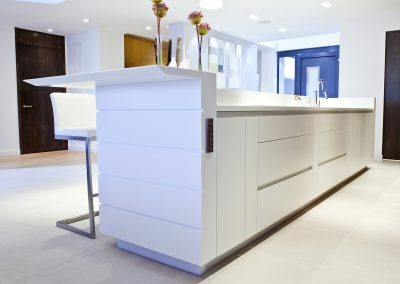 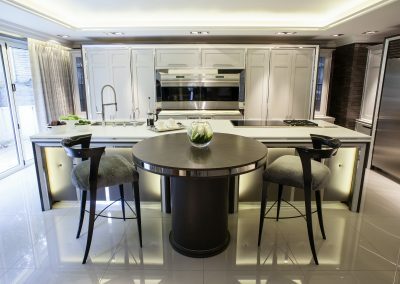 Darren Jenner, London Kitchens At Gallery Kitchen Design, Interiors & Furniture, Halifax, Leeds, Harrogate, London & Cheshire. 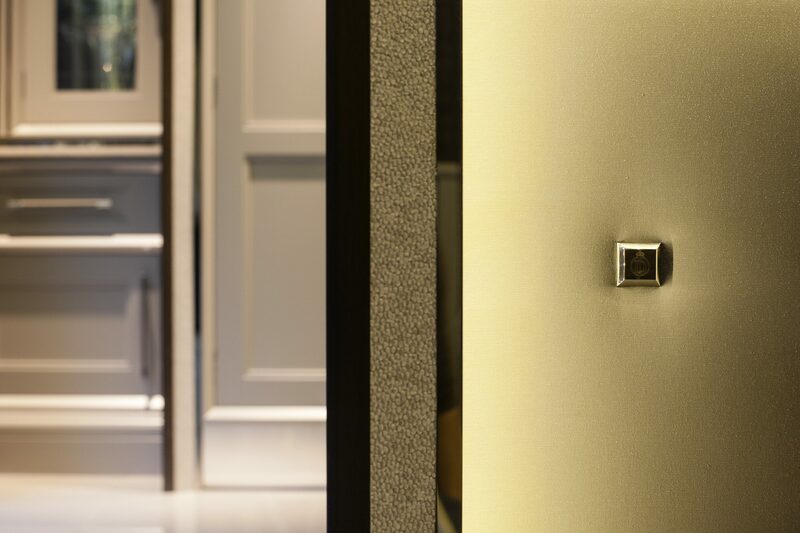 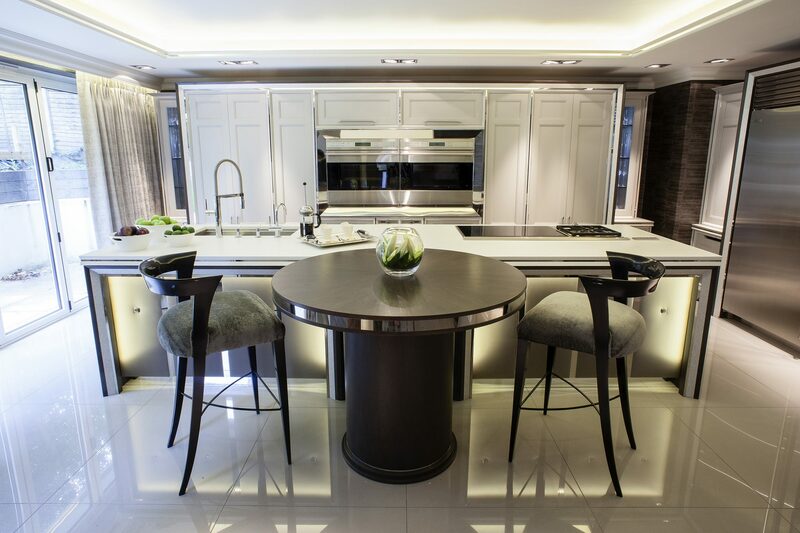 The Gallery is proud to represent National & European award-winning Darren Jenner, London as its official UK dealer. 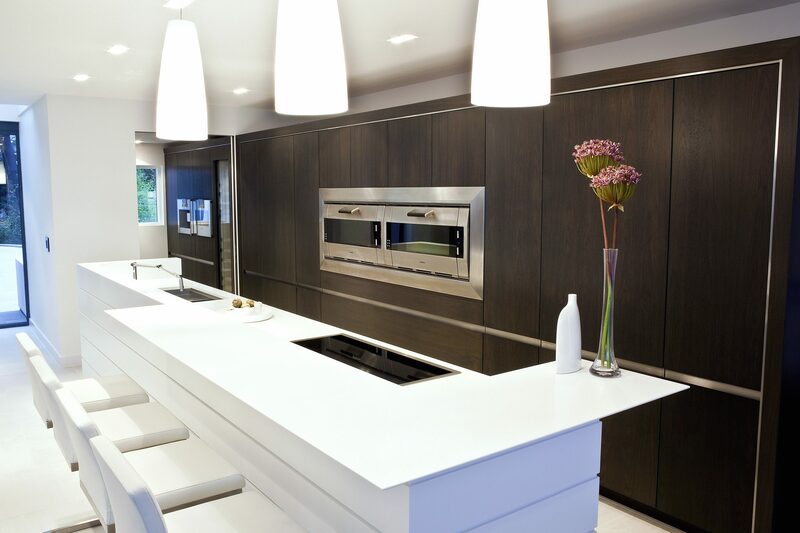 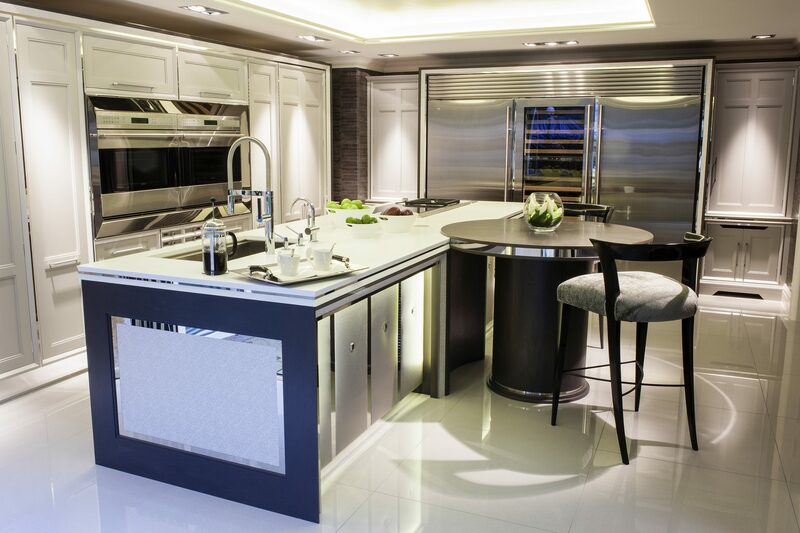 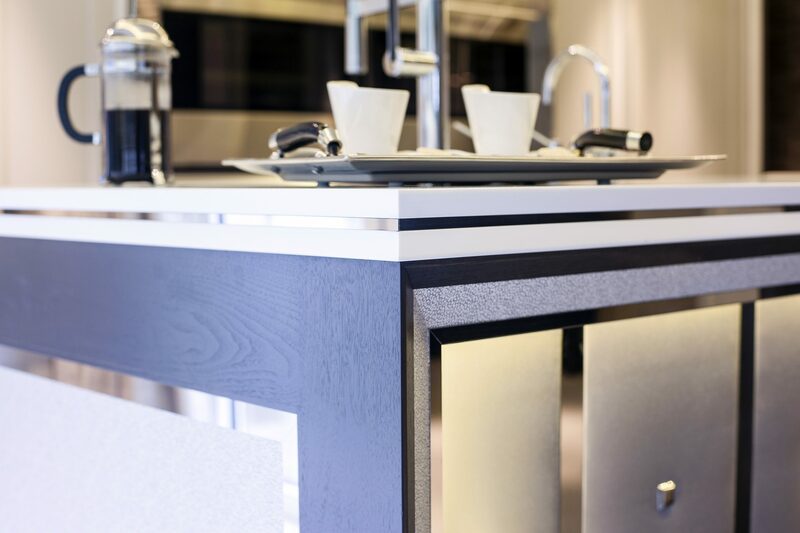 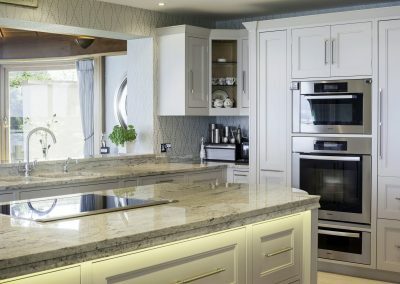 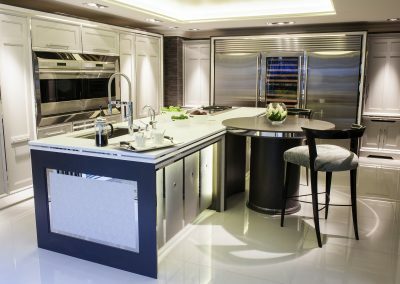 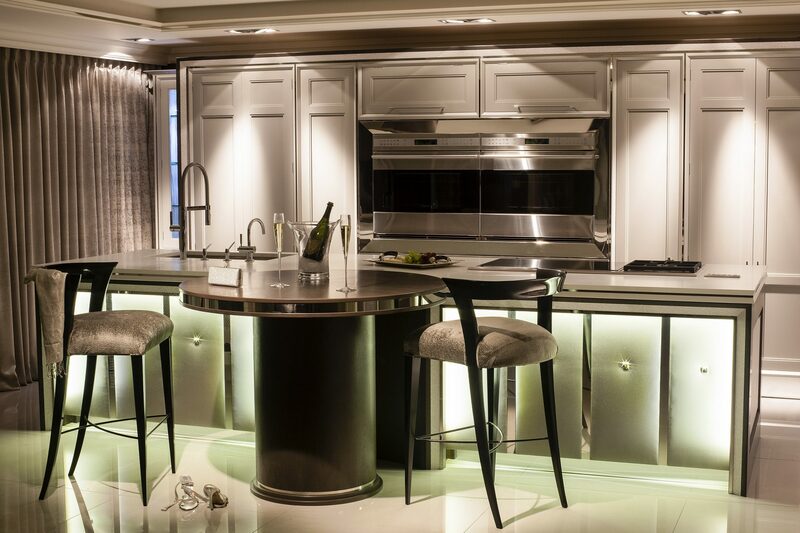 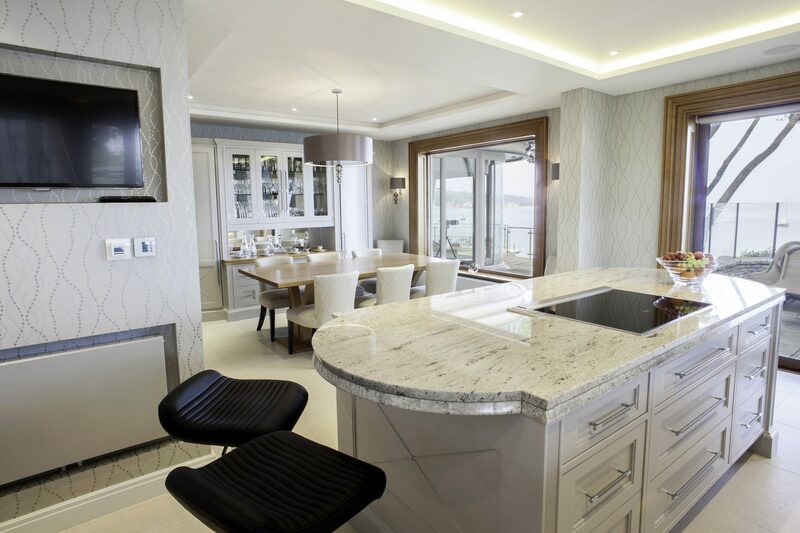 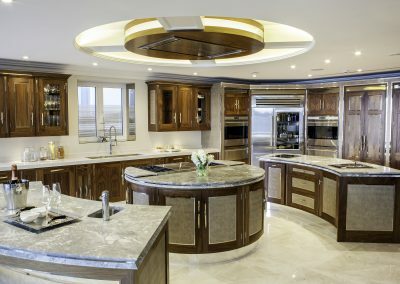 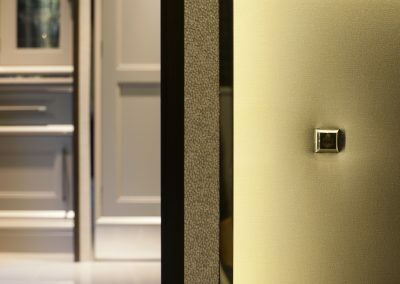 These British kitchen designs have been featured in the prestigious showrooms of bespoke appliance manufacturer Sub-Zero Wolf at 251 Brompton Road in Knightsbridge, London. 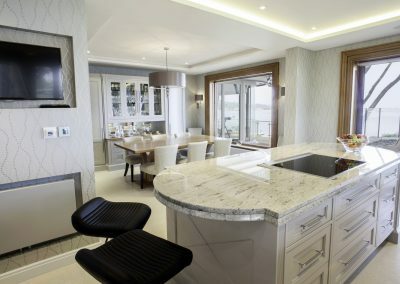 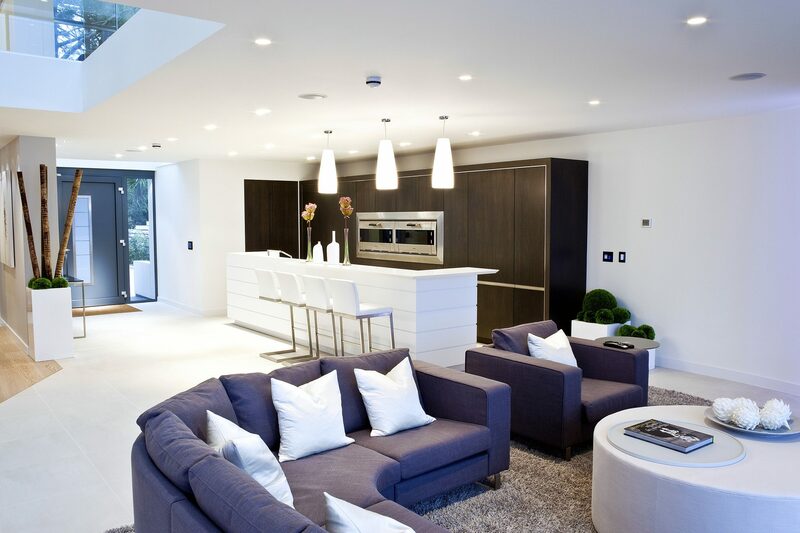 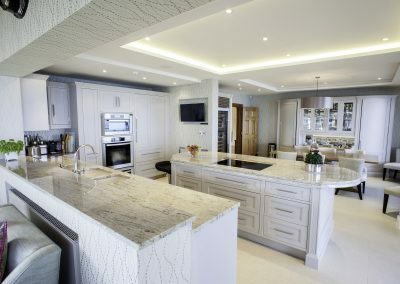 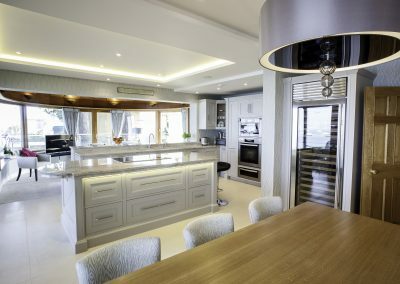 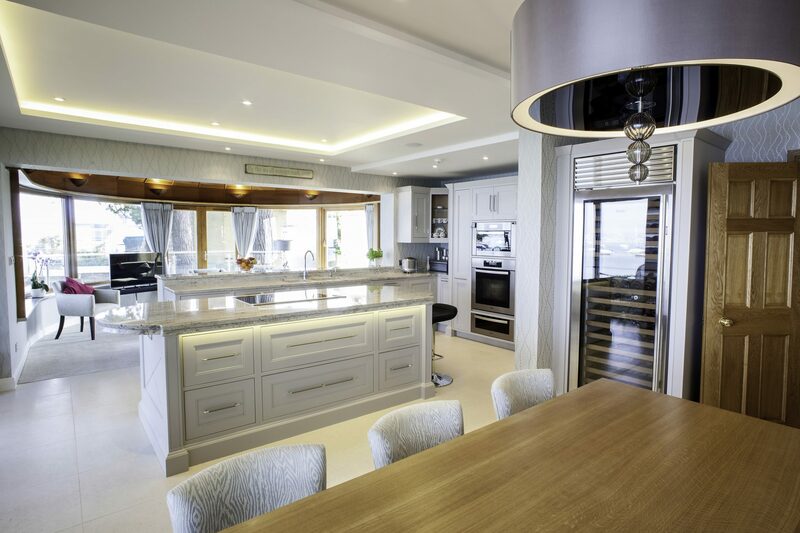 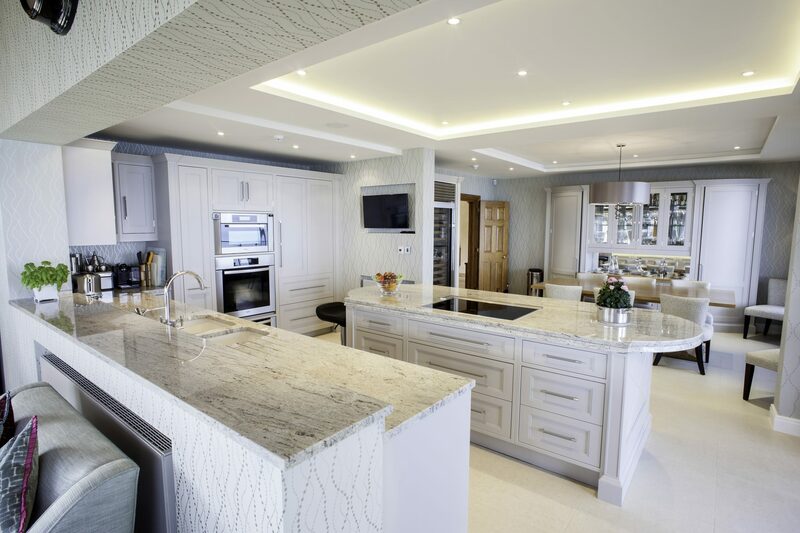 Awards include 12 Judge panel ‘Kitchen, Bedroom and Bathroom Magazine’ ‘Kitchen Designer of the Year 2013’ and 2013 regional runner up in the ‘Best Traditional Kitchen Design category competition run by Sub Zero Wolf. 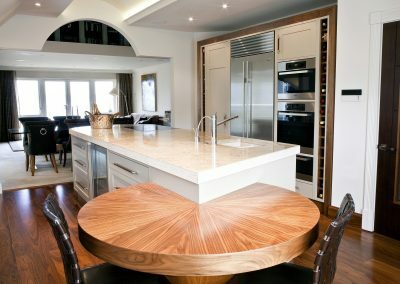 Contact the Gallery to have us create & install your new bespoke kitchen inspired from the similar designs below & from our portfolio. 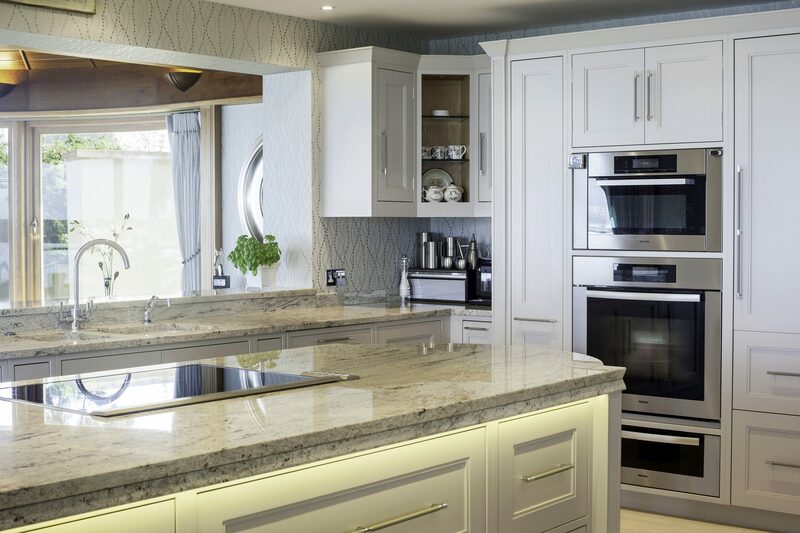 Alternatively you can commission us for an exclusive or limited addition kitchen in keeping with the styles in this collection. 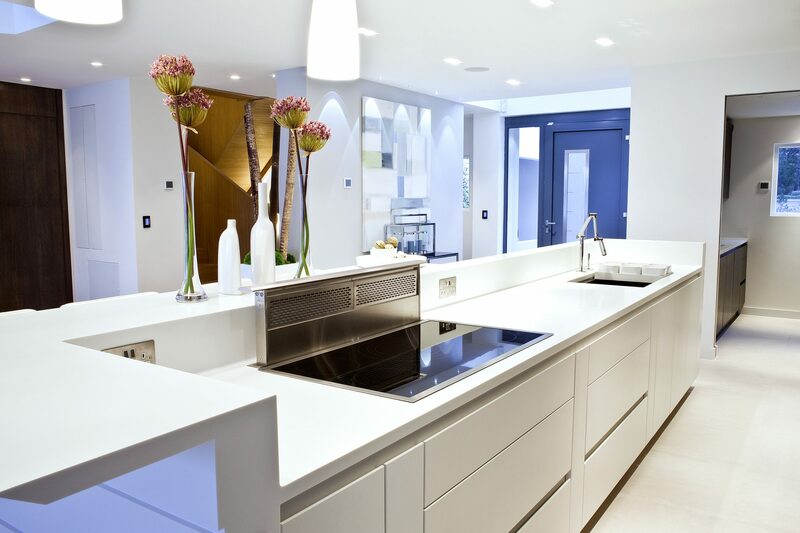 Our white Ice Corian Kitchen Island was linear designed with close detail and blends perfectly with the colour scheme of the clients home. 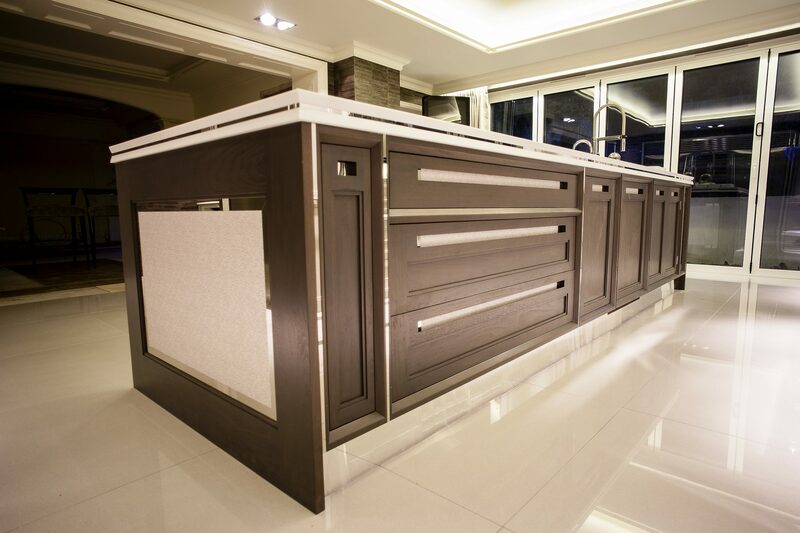 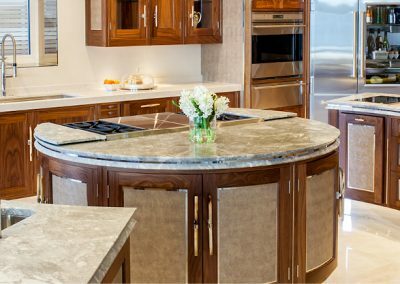 The Deep Tones Of The Walnut Cabinetry Provides Contrast To The Island & Defines The Kitchen Area In The Room. The Open Galley Style Design Allowed For The Room To Retain Space & To Ensure The Stunning View Beyond The Living Area Remains Visible From Every Angle Of The Room. 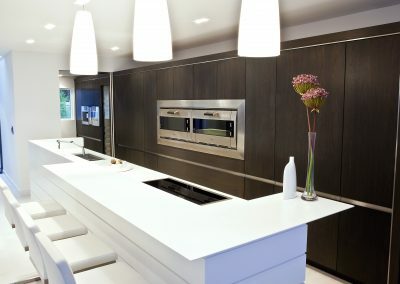 The shapes of the front door and entrances to the staircase and utility are mirrored by the walnut fascias, with the island a natural divide between the kitchen and walkway. The Telescopic Extraction System & Hob Were Designed To Ensure Preparation & Service Areas Have Maximum Use. 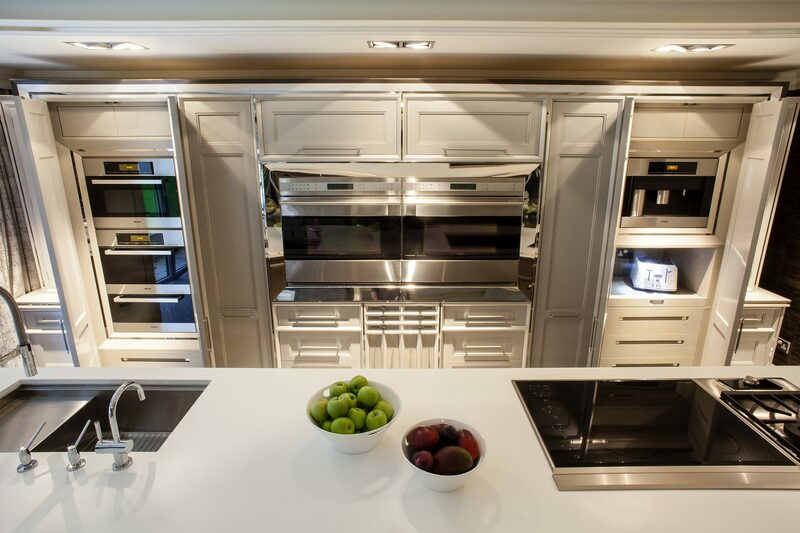 The extraction system controls were positioned for safety and easier control and note the linear drawer system. 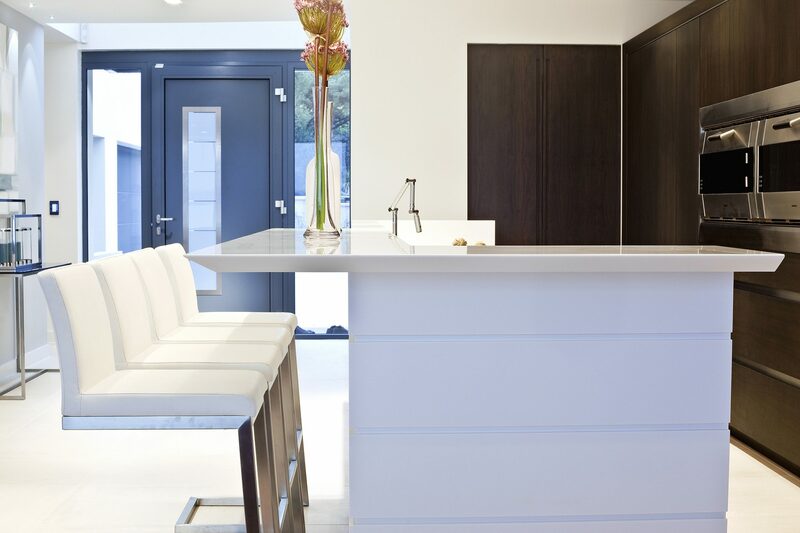 Alignment of Stools With The Worktop Enables Easy Entertaining & Clear Views Of The Cooking Area & Double Ovens. 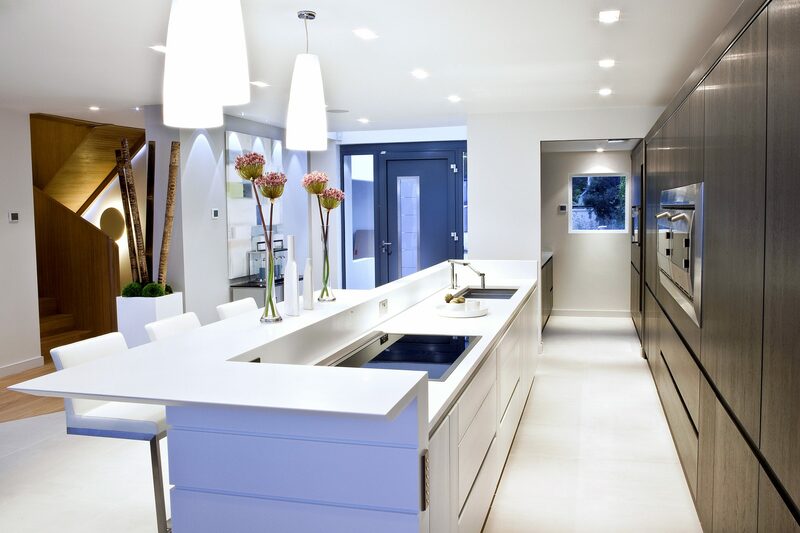 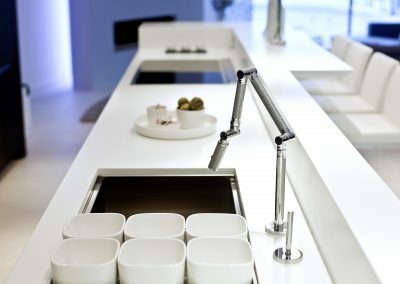 Bespoke Sink & Taps Were Designed Into The Corian Island Worktop To Create A Self Sustained Kitchen Preparation Area. 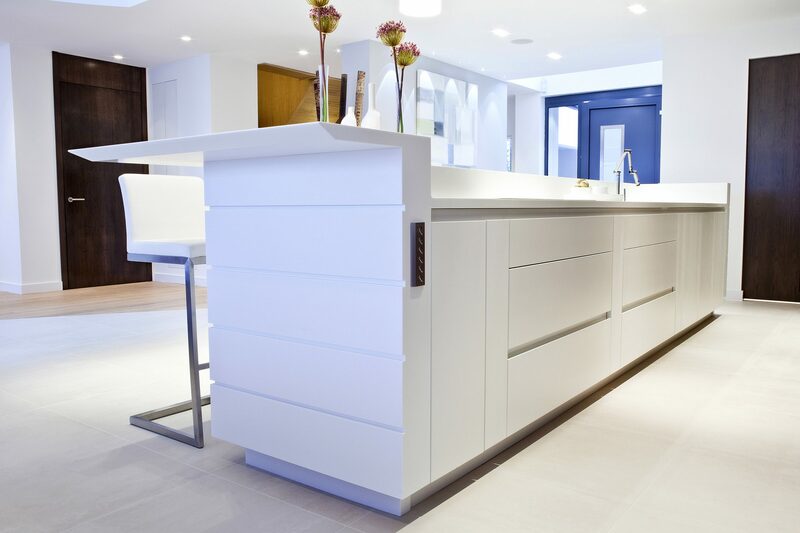 Painted Triple Door Panel Kitchen With Textured Metal Trims & Featured Island. 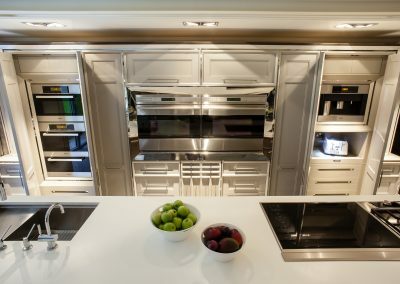 View Of Kitchen With Built In Storage And Feature Sub Zero Wolf Fridge, Freezer And Wine Cooler. 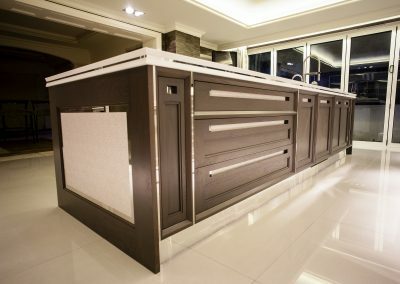 Bespoke Circular Bar Design With Inlay & Fabric Finishes. 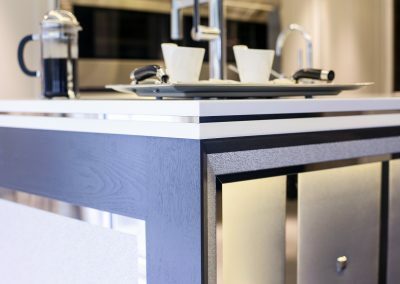 Close Up View Of Island Finishes And Inlay Design In Worktop. 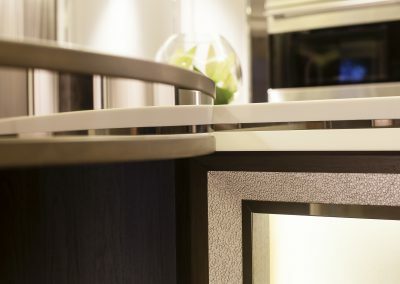 Close Up View Of Inlay In Our Design Forming of Circular Bar Edge With The Worktop On Island. 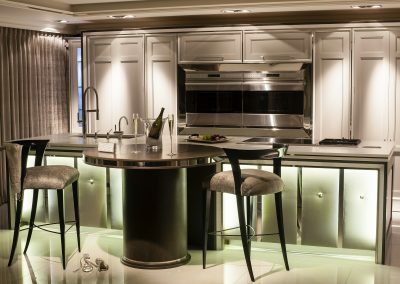 Bespoke LED Lighting And Upholstering of Panels In This Kitchen is An Example of Our Specialist Expertise And Craftsmanship. 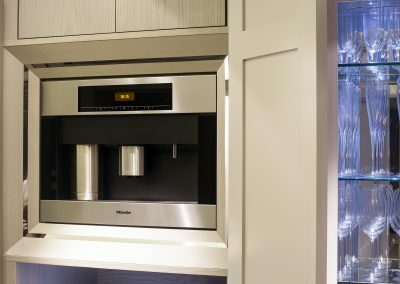 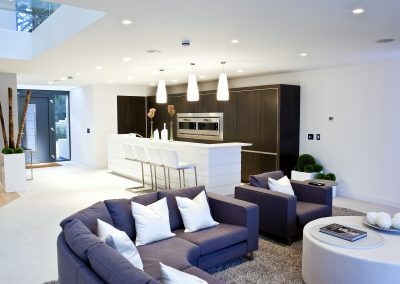 The Kitchen Design included a Bean To Cup Miele Coffee Machine In one of the Tall Panelled Cabinets. 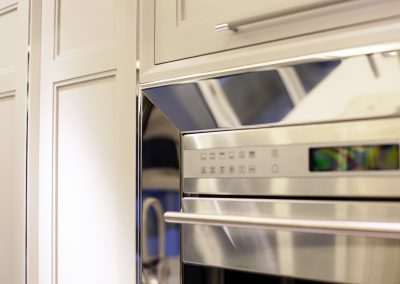 Close Up View Of Built In Oven Steel Trim And Door Design Finish. 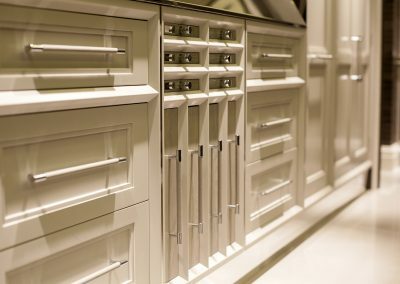 The Kitchen Included A Central Multi Storage System Including Quad Pull Out, Drawers And Six Cutlery Drawers With Bespoke Handles and Knobs. 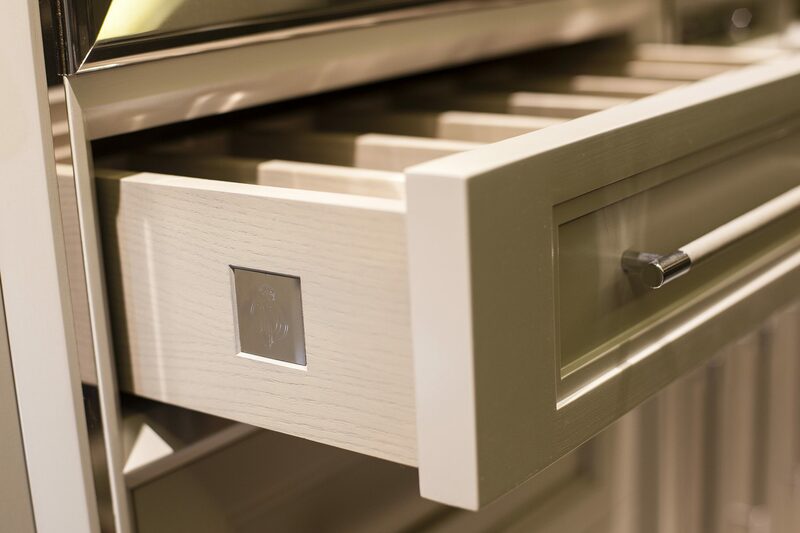 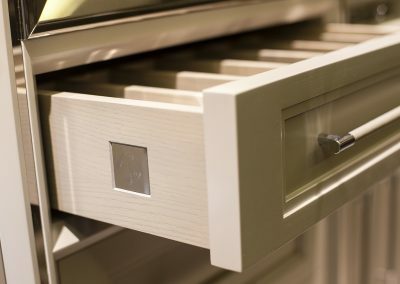 Bespoke Timber Drawers With Signature Plaque Were Included In The Kitchens Design. 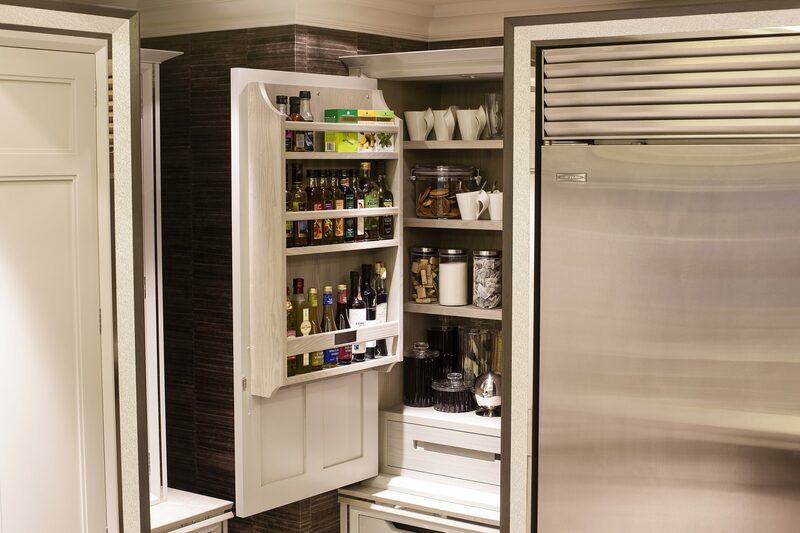 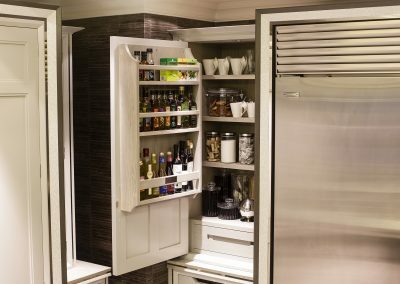 Upper Pantry & Rack Storage Was Designed To The Left Of The Cooling Appliances. 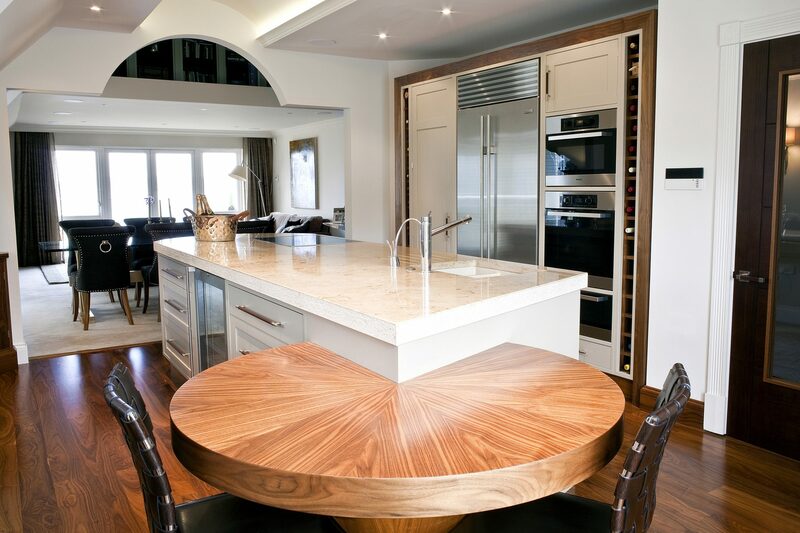 Walnut & Wheel Feature Island Fabric Panelled Finished Kitchen. 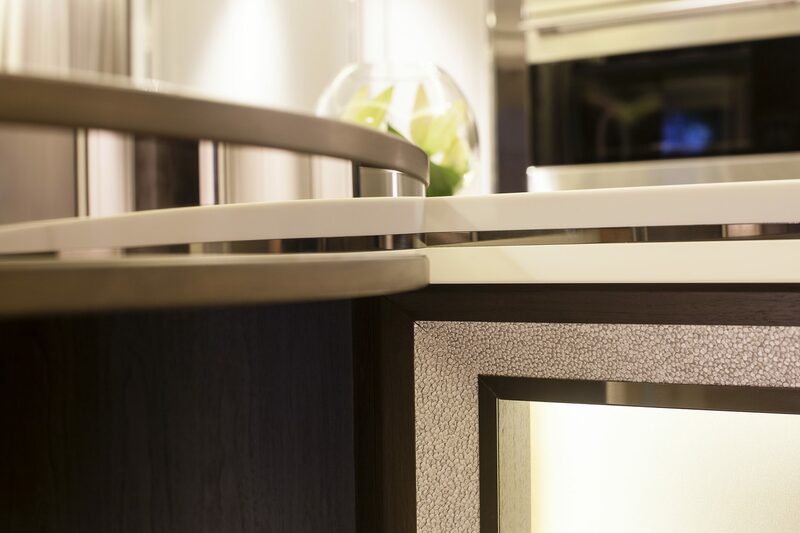 Close Up: Walnut & Wheel Feature Island Fabric Panelled Finished Kitchen. 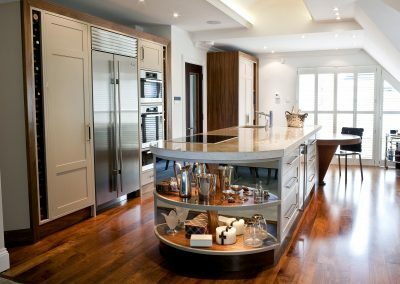 Open Shelved Island With Built In Storage & Sub Zero Wolf American Fridge Freezer. 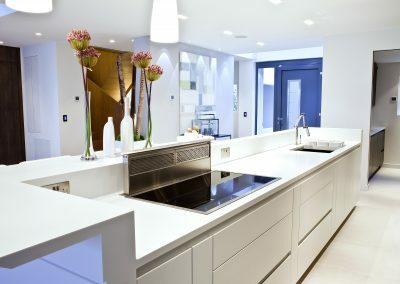 Decor Matched Feature Kitchen & Design Project. 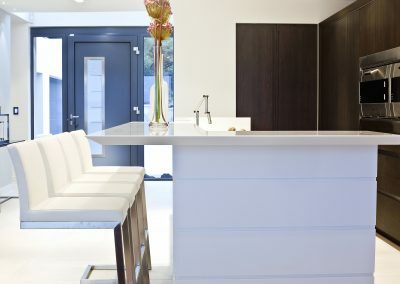 Light Timber Table With White Fabric Finished Chairs. 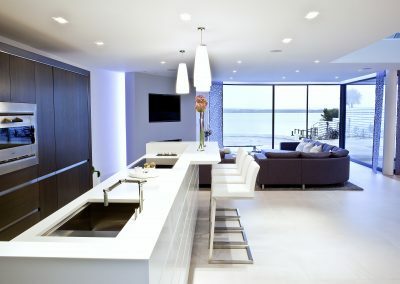 Decor Matched Kitchen View To Designed Dining Area. 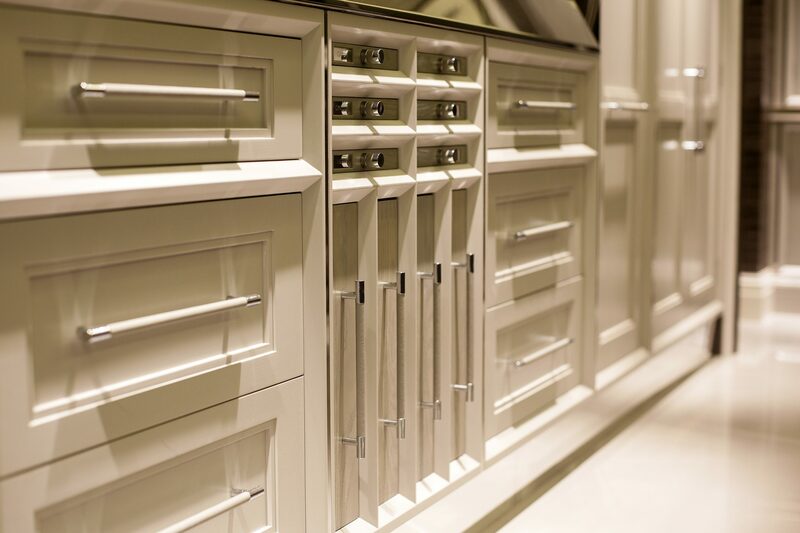 Close Up Image of Decor Matched Kitchen Storage & Oven Run.